A view of the remnants of a Gothic castle, scattered down a hillside, with the sea behind on the left and a large town immediately below and beyond. This is a finished drawing, carefully composed to take advantage of the higher wall on the right, the rising and sinking ground, and the vistas of the town and sea. It may have formed the first stage of a finished painting. 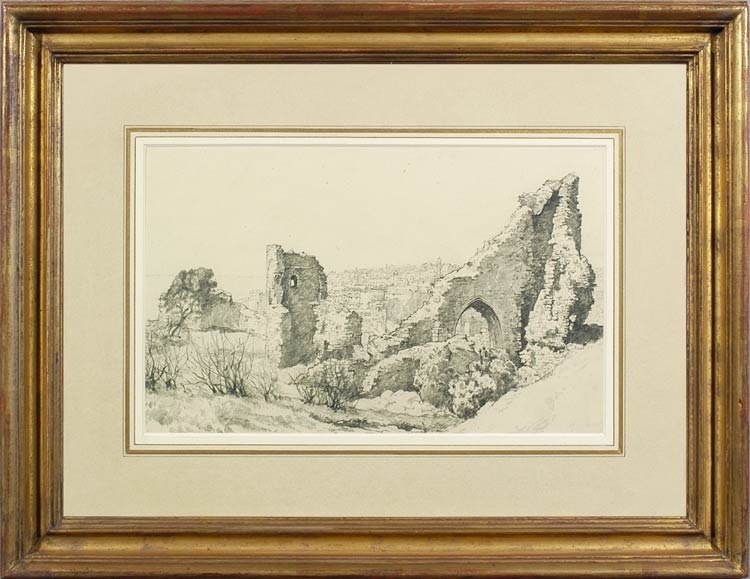 It displays all Nicholls’s talent for depicting and heroizing buildings; the contrasts of light and shade are calculated to emphasize the spatial depth and the solidity of the remaining walls, and to set off the military purpose of the castle against the romanticism and melancholy of its decay. Bertram Nicholls (1883-1974) was born at Didsbury, son of a Manchester businessman. He trained with Reginald Barber, a local portrait painter, and then for three years at the Slade, ‘but two of those years, he maintains, were wasted.’ In 1904 he studied Velasquez in Madrid; on his return he worked with Frederick Jackson, one of the Staithes Group of artists [see John William Howey], with whom he learnt landscape painting en plein air. In 1911 he met the New York artist Frank Mura and later settled in Sussex, very near Mura, whose work was a formative influence on his own art; two further important influences were Reynolds and Richard Wilson. Nicholls exhibited at the Royal Academy from 1912; from 1923-34 he was president of the Manchester Academy of Fine Arts, and in 1931 was elected president of the Royal Society of British Artists. His first one-man show (a sell-out) was held at Barbizon House in 1924; he exhibited there in 1926, 1928 and 1932; in 1933 he had his first exhibition of watercolours at the Fine Art Society. Works in public collections include San Giovanni Nepomuceno (Maidstone Museum & Art Gallery); Rochester Castle (Bradford Museums & Galleries); Quay in Italy (Southend Museum Service); Chepstow Castle and The Bridge (both Worthing Museum and Art Gallery); Riverside town (Brighton & Hove Museums & Art Galleries); Lancing Chapel (Towner Art Gallery); and others in Aberdeen Art Gallery and Museums; Adelaide, Art Gallery of South Australia; New Zealand, Auckland Art Gallery; Birmingham Museum and Art Gallery; Bristol City Museum & Art Gallery; National Gallery of Ireland; Liverpool, Walker Art Gallery; London, British Museum, Guildhall Art Gallery and Tate; Manchester City Art Gallery; Montreal Museum of Fine Arts; National Gallery of Canada; Preston, Harris Museum and Art Gallery. See the RSBA publication of his work – Bertram Nicholls (1883- ), Frank Rutter, 1935, ed. of 750 – which quotes Nicholls extensively from articles in The Artist, VI, nos 1-6, Sept.-Dec. 1933 & Jan.-Feb. 1934. See also Painting in Oils by Bertram Nicholls, The Studio Publications, 1945.